Coasters have many names that inspire awe and bring forth images of fear and respect. Big Bad Wolf, Medusa, Roar!, Kumba, and Grizzly are a few examples. So when you see a coaster called "The Coaster", you instantly assume that with a name that boring the coaster must be equally boring. Nothing could be further from the truth. This is a classic old double out-and-back woodie built by legendary designer John Miller in 1935, The Coaster has been a highlight of the Western Washington Fair in Puyallup, Washington for over 65 years, and still offers a great ride. 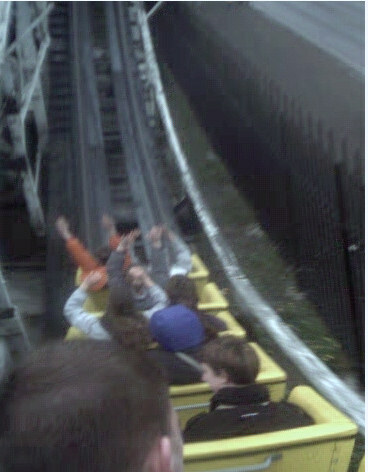 We climbed aboard Ol' Yeller (one of 3 trains) on a chilly spring afternoon and headed up the 57 ft lift hill. 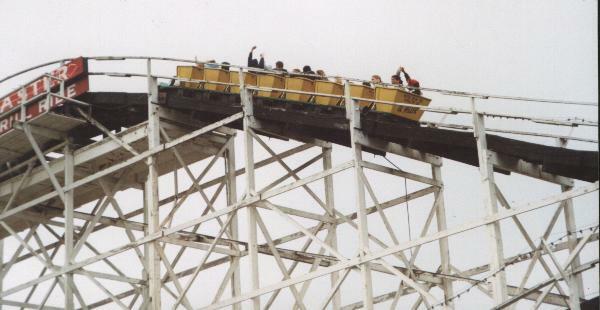 The first drop was a great double dip and we got a ton of airtime from the back seat. The train then headed up a hill and into the first turn around. We dropped into a slightly twisting drop off the turnaround and headed up to the peak of the next hill. This next drop is the best one on the ride, producing a great floating airtime the whole way down. The train flew over a couple of hills before reaching the next turnaround right over the station. The next section of track featured several bunny hops and a great double down. We got some air, but it seemed that the little coaster wasn't quite giving us its all. We got to the final turn around and entered the best part of the ride. After a sharp, banked turn, we went down a short drop, turning at the same time. The train was now traveling through the middle of the structure, throwing us out of our seat over each hill. With every hill, I became more and more sure we would hit the beams of the wooden structure over head. We finally hit the brakes, moving faster than we had the whole ride. This ride may have lost a little over the years, but it is an excellent woodie. If you are in the area during either the Spring Fair or the September Fall Fair, get on over and ride this beauty. CLICK HERE TO RETURN TO THE PUYALLUP FAIR PAGE.